“This is the fun part of my job,” says Jeff Henry, principal co-owner of Schlitterbahn Water Parks, as he thumbs through his Architect’s drawings an inch and a half deep. They look like the opposite of fun and more like last-minute exams. Henry, an award-winning inventor, and water-park developer, has implemented, designed, or somehow had his hands in the stream of water-park technology for over three decades. He holds over 60 patents on water-ride technology. Whether he was the brains, the brawn, or the funding, his foresight exponentially advanced an industry that now has tech standards like the Master Blaster uphill water coaster; the Boogie Bahn FlowRider surf simulator; and the AquaVeyer guest conveyor belt. Henry and his crew (equally eccentric engineers / brainiacs) have created Schlitterbahn family parks across Texas and in Kansas. And in destinations like the world-renowned Atlantis mega-resorts in the Bahamas and Dubai. 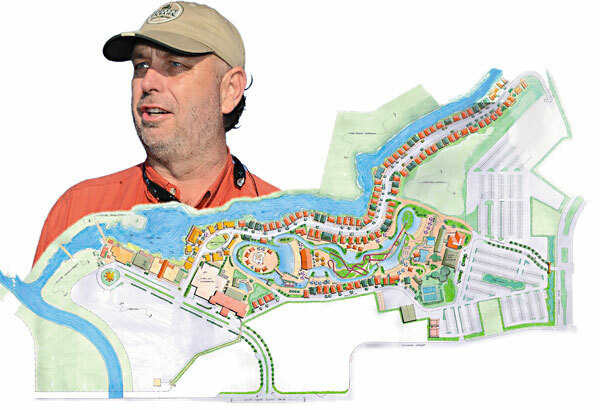 Jeff Henry’s been dreaming big since the early days when parents Bob and Billy bought the Landa Resort on the Comal River in New Braunfels and began to develop what is now the Schlitterbahn adjacent to the Texas Hill Country Park in New Braunfels. “I don’t have a job, I have a lifestyle. I get up in the morning and go ’til I drop. “I’m an Applied materials technologist” , “I apply used materials that I find – some people call it junk; some people call it trash; I call it found art. At Schlitterbahn, sustainability may create whimsy, but it’s no mere whim. Henry’s Schlitterbahn Development Group is an industry leader. A quick click of the remote to tune into any of the Travel Channel’s top-water-parks shows always includes the Texas-grown attraction. This year, Schlitterbahn celebrates 35 years in the entertainment industry. “Schlitterbahn has a repeat business,” says Henry. “People come back because there are memories built on good times in the Hill Country or on the beach. Our goal is to bring an integrated experience to people, a place where they can bond and be together and build these lasting memories. There’s a lot of competition for people’s time, but not much competition for things that people can do together,” he insists. The season has just begun for the four parks in New Braunfels, Galveston, South Padre, and Kansas City. And now in Corpus Christi, the Schlitterbahn team is polishing up the new park this summer.